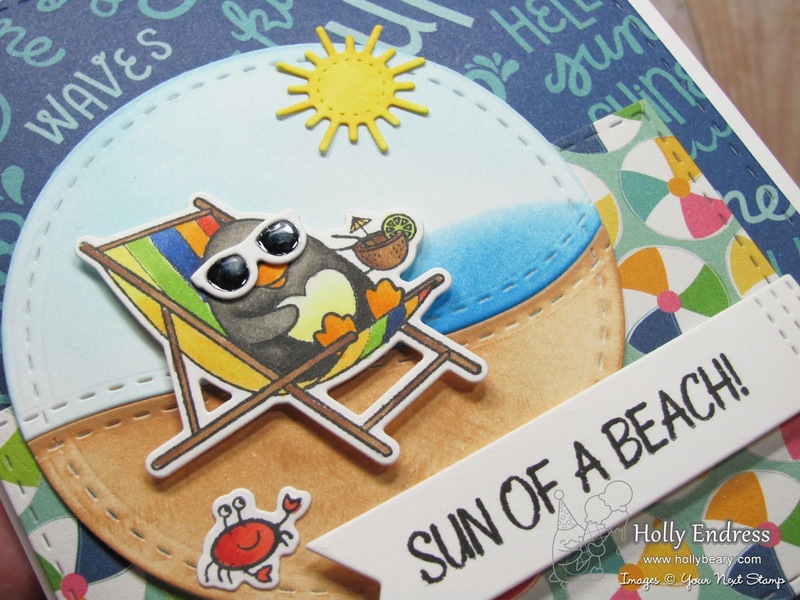 Hollybeary Creations : July Release Blog Hop!! 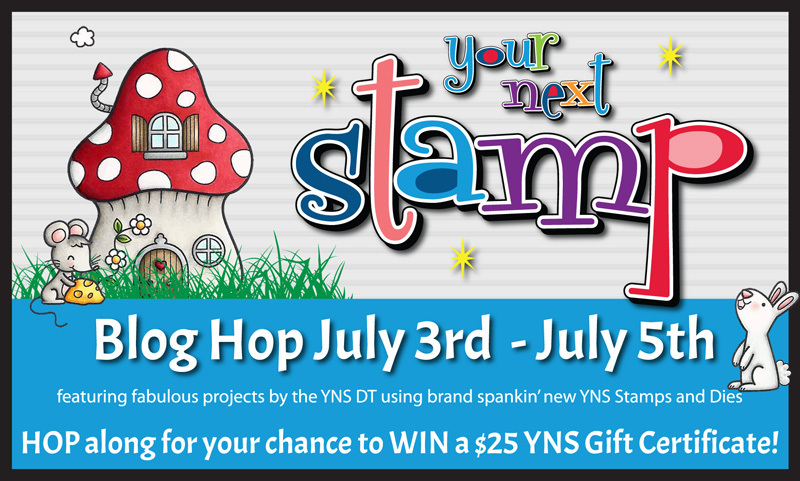 It's time for our July Release Blog Hop at Your Next Stamp.. Be sure to leave comments along the way for a chance to win a $25 GC to the YNS Store! This month's release is Fabulous!! My first projects using Little Darling Mermaid. This is a fun set with lots of great sentiments. The inside of my card says " Shell-abrate ". I stamped the image onto some Copic friendly card stock and colored it in with Copics and then I die cut the panel with the Large Stitched Rectangle Die and adhered it to a White card base with some foam tape. For some sparkle I added some Clear Wink of Stella and some Ocean Mist Sparkling Gumdrops. My second card uses the adorable new Waddles. Waddles Beach Fun and the Coordinating Dies. I Paired the images with some fun Papers from Pebbles and created a beach scene with some Distress Ink. The Inside says " I missed your Birthday ". YNS sets always have the best sentiments! I even added some Glossy accents to his cool "80's" Shades. We have a sale going on as well.. Be sure to shop and get some of your Favorites along with the New Release and be sure to share your projects with us on Social Media using #yournextstamp so we can see them. 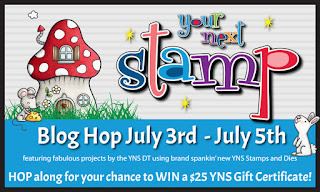 Let's get Hopping.. Use the Linky Below to Hop along and leave comments along the way for a chance to Win! Such fun cards with adorable little scenes!! I always love Waddles: He's so funny! The mermaid is adorable, too. Great job coloring and layering! Both of your creations are so adorable, love the beach scene! What an adorable pair of summer fun cards! Oh that Waddles! He always makes me smile! What a great group of cards. Thanks for the ideas. Your cards are so cute! The adorable mermaid and precious penguin warm my heart! Loving those shades! Sparkly and sweet on the first and super duper cute on the second. I really like the way you used the double stitched hill die. Love your cards the piguin and sweet and the mermaid is so cute. I love your Waddles card! He's adorable in his beach chair! OH my goodness how I so love the waddles beach card. It is so adorable. Love everything about it. Beautiful Card! Love the "sun of a beach" card! Love the penguin and the mermaid card. great work. Both cards are great but the 2nd is my fav! Its so colorful!!! That little mermaid is adorable. Such cute cards with awesome coloring! Love that cute mermaid! Fun penguin and sentiment too! I am so impressed with all your cards. You have done a wonderful job. Great cards! Love the sentiments!!! These are both so adorable! I LOVE the glasses on the penguin; they are the perfect finishing touch. 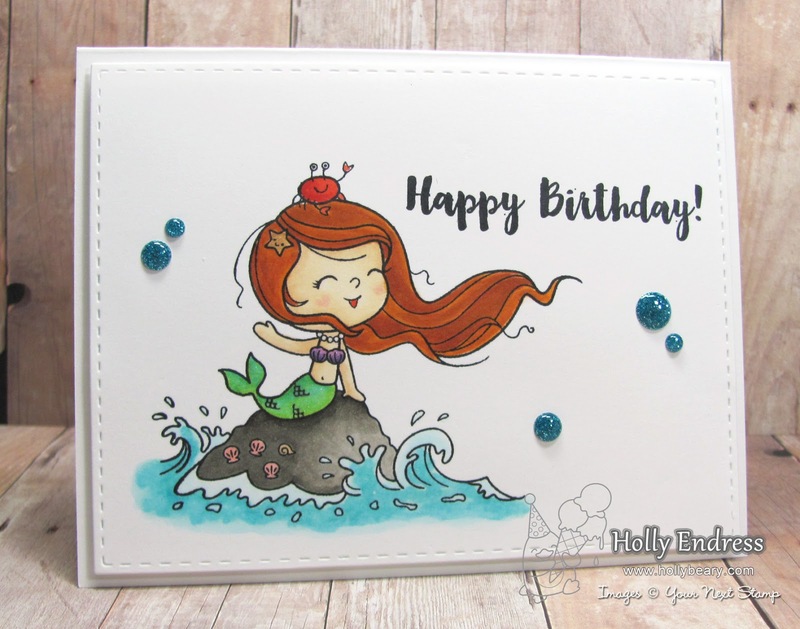 Your Mermaid is so pretty and I just LOVE that penguin - super cute cards! Such a fun cards. So filled with summer! Ordered Mermaid set - sad because the dies are not available. Fabulous creations using both my favorite stamp sets from this release! OMG!! 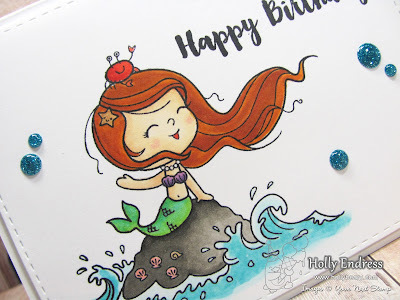 Your mermaid card is adorable...great coloring!! That "sun of a beach" card is out of this world punny...LOVE it!! Love your colouring on both of these cards. Very fun cards! Great new stamp sets. oh my goodness Holly, these are super cute. Fabulous coloring girl. Wow! Great release and amazing cards!!! Awesome coloring and darling cards. I especially like the second one. Great white space on your mermaid card. Love the design of the last card. Adorable cards and your coloring is amazing! Your mermaids card is just precious!! But since I am a huge fan of penguins I absolutely ADORE the penguin card!! Total cuteness! Song of the mermaid is Happy Birthday. Great job on this, and on the penguin card with that wonderful Pebbles paper. Both cards are amazing but I just adore Waddles! Love the owl popped back in his lawnchair. Gorgeous cards! I love Waddles and Little Darling Mermaid they are both adorable! Great coloring and choice of papers. Oh my..... They are so cute! Darling mermaid, and love the penguin beach card, so fun! Ahhh! These are so cute! Both cards are Fabulous but I LOVE that mermaid one!!!! Sooooooo CUTE!!!! !